As an introduction to the SO-VIDA company, we thought it would be a good idea to tell you more about how our journey into sous vide began. The first time we came across sous vide was back in 2011 after visiting a local restaurant and eating quite frankly the best Octopus I have had in my life. Remarkably, the Octopus was not chewy/rubbery and had a beautiful meat like texture. I then had to speak to the chef who told me that it was cooked sous vide and I promptly looked into finding out more about this cooking technique. 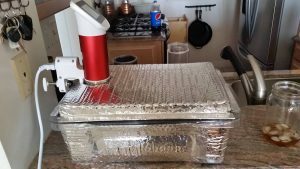 Although the options in 2011 to cook sous vide were far more limited, we still managed to get the appropriate equipment and we have been cooking sous vide almost every week since. In recent years the sous vide market has gone from strength to strength as cheap immersion circulators have entered the market which has allowed many new people to enjoy sous vide cooking for the first time. Despite the growth in popularity of sous vide, we felt that the accessories available were largely very poor in quality. For instance, for a long time I had been using towels to insulate my container. Although this did a great job of providing insulation, quite frankly it was an extremely ugly solution and not something I would be proud of when I had guests over. Some other sous vide users have tried a variety of solutions including Reflectix as seen below. 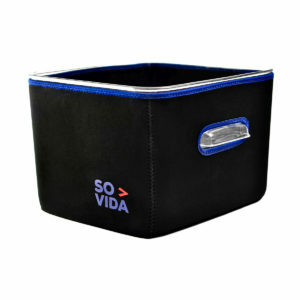 The need for a better solution was the catalyst that led to the formation of SO-VIDA. We initially started by creating the Sous Vide Sleeve, however after being blown away by the positive reaction, we quickly moved on to creating many new products. Our mission is clear, we want to continue to bring you the best sous vide products and accessories in the market.